Vintage Christmas can come anytime of the year. Why not this lovely society silk holly berry embroidery square table doily mat. 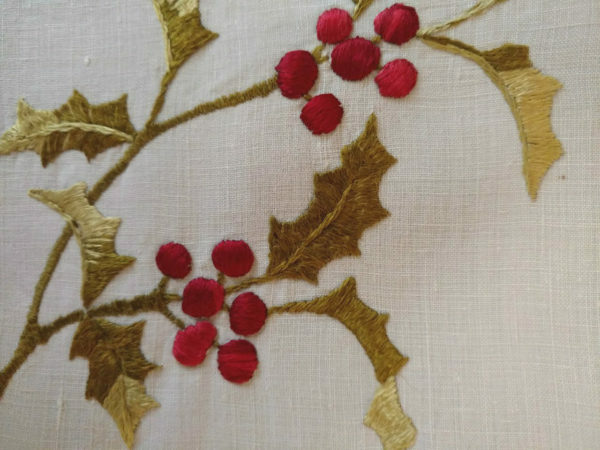 Dating from the Victorian or Edwardian era, the cloth features a large cluster of berries in two opposite corners. In the other two corners, a single cluster. Festive colors of greens and reds. Embroidered on white linen, the table linen is embellished with a simple hemstitching border.